RIPTA, the Providence Department of Planning and Development, Mayor Elorza, Governor Raimondo, and the State’s Congressional Delegation today announced an enhanced transit corridor through the capital city’s downtown. The corridor will feature RIPTA buses running on a 1.4 mile route between Providence Station and the Hospitals with 4-5 minute headways. The US Department of Transportation has approved the use of the City of Providence’s $13,000,000 TIGER VI grant for the construction of a Downtown Enhanced Transit Corridor that will provide scheduled, frequent bus service through the heart of Downtown. 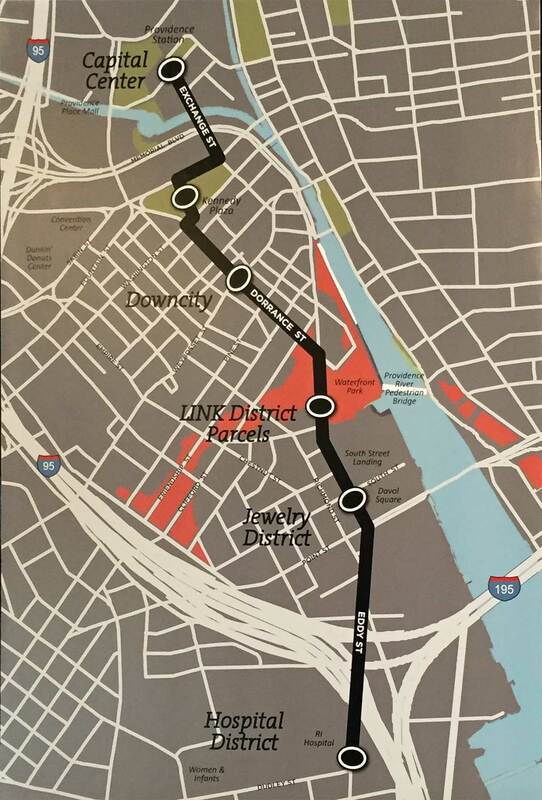 The 1.4-mile corridor will provide bus service as frequently as every five minutes during peak hours, connecting Rhode Island’s largest employment hubs and world-class institutions to the downtown core and adjacent neighborhoods, while passing directly through the LINK District, the City’s key redevelopment area made available by the recent relocation of Interstate 195. The $13,000,000 in TIGER VI funding was originally awarded to the City of Providence, in partnership with RIPTA, in 2014 for the construction of the Providence Streetcar project, which was proposed to connect the Hospital District and College Hill through downtown Providence. The City of Providence, RIPTA, and RIDOT have worked together over the past several months to develop an alternative project for the City’s TIGER grant funds to strengthen the project and ensure that it better aligns with the goals of the community, City, and State and can be delivered at a lower cost. Service for the Downtown Enhanced Transit Corridor will run along Exchange, Dorrance, and Eddy streets, providing service to key destinations, including Providence Station, Kennedy Plaza, Downcity, the LINK District, South Street Landing, and the Hospital District. The estimated total capital cost for the project is $17,000,000. As the State’s mobility manager, RIPTA will manage the bus service on this new route which will be serviced by existing RIPTA buses. New branding will make the route and the buses that serve it easily recognizable for passengers. Multiple existing RIPTA bus routes will be modified or have their service extended to serve the Downtown Enhanced Transit Corridor. Buses running those routes will then continue on to their final destinations beyond the core of downtown Providence. Riders from these key destinations across the metropolitan area will benefit from direct connectivity and improved service to the Downtown Transit Emphasis Corridor. Bus stops along the corridor will include a high level of passenger amenities including branding, bus shelters, seating, real time arrival information, increased signage, ticket vending machines for off-board fare payment, WiFi, and integrated bike-share amenities. The service will provide passengers with quick and reliable transportation between Kennedy Plaza, two new intermodal transit hubs planned for the areas around Providence Station and the Hospital District, and key office, retail, entertainment, and institutional destinations both within and beyond the Downtown core. At the Providence Station, the route will connect riders to Amtrak service as well as MBTA Commuter Rail service to Boston, TF Green Airport, and Wickford Junction. The development of two new intermodal transit hubs at Providence Station and in the Hospital District, coupled with ongoing growth of intercity and commuter rail service, will increase transportation options and development opportunities while jump starting RIPTA’s recently-developed plans to redesign Downtown bus service around multiple intermodal hubs. PROVIDENCE, RI – Mayor Jorge Elorza today joined Governor Gina Raimondo, the Rhode Island Congressional Delegation, representatives from the Federal Transit Administration, RIPTA, RIDOT and community stakeholders to announce plans for a 1.4-mile Enhanced Transit Corridor in Downtown Providence. The project will provide peak bus service, on an average of every five minutes, connecting Rhode Island’s largest employment hubs and world-class institutions to the downtown core and adjacent neighborhoods, while passing directly through the LINK District, the City’s key redevelopment area made available by the recent relocation of Interstate 195. “We need to better connect neighborhoods and economic centers across the City and ensure riders can safely and conveniently get where they need to go. The project Mayor Elorza and the State have developed will have the feel and convenience of a street car, with dedicated shelters and stops, signal prioritization, and frequent service — so if riders miss a bus across town during rush hour, they’ll only have to wait a short time for the next one. This plan offers greater convenience and more flexible service, while also saving about $100 million in capital costs that would have come with laying rails in the ground for a streetcar. This is a smart and cost-effective investment in enhancing Providence’s transportation system now and in the future, and I am pleased we were able to work with the U.S. Department of Transportation to make these federal TIGER funds available,” said U.S. Senator Jack Reed, the Ranking Member of the Appropriations Subcommittee on Transportation, and Housing and Urban Development (THUD). The project utilizes $13 million in TIGER VI funds which had previously been awarded for the construction of a street car. The revised proposal, which has been approved by the US Department of Transportation, is better aligned with the goals of the community, City, and State and can be delivered at an estimated total capital cost for the project is $17 million with additional funds provided by the state. Service for the Downtown Enhanced Transit Corridor will run along Exchange, Dorrance, and Eddy streets, providing quick and reliable transportation between Kennedy Plaza, two new intermodal transit hubs planned for the areas around the Providence Station and the Hospital District, and key office, retail, entertainment, and institutional destinations both within, and beyond the Downtown core. Bus stops along the corridor will include curb extensions to accommodate waiting passengers, bus shelters, seating, real time arrival information, increased signage, ticket vending machines for off-board fare payment, branding, WiFi, and integrated bike-share amenities. This sounds great, especially with all the amenities they’re touting. Seems to be the best case scenario in lieu of a streetcar. I ride RIPTA buses at least once a day, usually twice a day, and sometimes even more often. I have taken buses to destinations all over Providence and the entire state. I have never needed to take a bus ride from the train station to the hospital. Why are those in charge so certain that this is an underserved corridor? I understand that they want a transit line that makes the Jewelry District more attractive to developers, but this line connects places to places, not people to places. No one lives at the train station, no one lives at the hospitals, and hardly anyone lives in the Jewelry District. Who the hell is this expensive bus line for? The route would largely be a trunk line if I understand it properly. Buses from the north would serve the train station then terminate at the hospital and vice-versa. People wouldn’t need to transfer at KP to make those connections. People coming in on other lines could transfer along the corridor to reach either the train station or the hospitals. Interstitial trips would be better served as well, like the hospitals to the Med and Nursing Schools every five minutes. Or the train station to Wexford every 5 minutes. No details yet describing any means to let buses spend more time rolling than stopped at lights and stuck in traffic. Note the mention of signal prioritization. There was some talk about changes to road design… I don’t think anyone actually said, “bus lanes.” I would imagine RIPTA and Planning both would like to see actual exclusive bus lanes along parts of the corridor and RIDOT and the City might be pushing back, but that is just speculation on my part. I’d like to see this line laid out in such a way that it would work with a future east-west corridor, likely along Washington and the bus tunnel. That would probably put all the transfers in Kennedy Plaza. This route needs to be more than just a branding exercise. Only six stations are proposed (total of 12 stops), so without exception all “Downtown Enhanced Transit Corridor” bus stops should extend to the travel lane using bus stop neck-downs or bump-outs, as well as provide level boarding. For these bus stops a few parking spaces would have to be removed at each location. The floor level of low floor buses, range from 12 to 14 inches depending on the manufacturer. A 12-inch elevated platform located within a neck-down would be adjacent to the existing standard sidewalk, connected by both a slight ramp up (similar to a curb ramp) and a single step. Buses with higher than 12-inch floors could kneel to the platform, when needed for a wheel chair. For older buses with steps, people would step up or down the same as they do now. At a minimum the length of a stop bump-out should be able to accommodate two, if not three, convention buses. A two bus configuration would allow for multiple buses when more than one arrives at the same time. Also, if in the future RIPTA were to obtain articulated buses, the stops would already be long enough those longer vehicles. The Kennedy Plaza style bus shelter or a more substantial canopy should be at each stop. 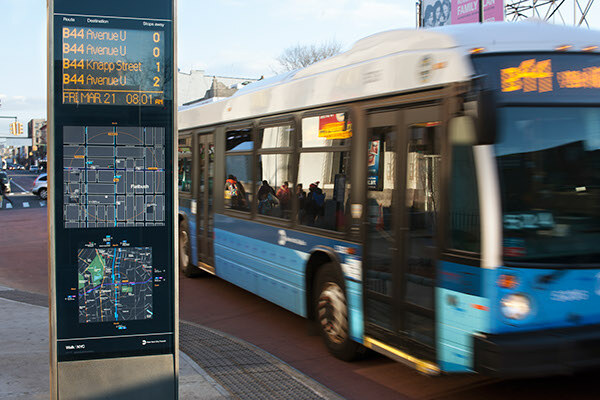 Real time signage that lists bus numbers and arrival times, as shown in this SBS (Select Bus Service) example from Brooklyn, should be installed at each stop. Real time arrival information would be great. I think not knowing on-time arrival information is a big factor in why RIPTA is not utilized more. However, at a minimum, can we please get a proper system to enunciate and/or display all the stop locations onboard the bus? Not to get off topic, but this is a basic feature that RIPTA should be able to operationalize? Any idea what has prevented this? I find the alignment of the first attempt at a trunk line a bit peculiar, but I guess it makes sense of the idea is giving better access to hospital employees coming from points north and better train access to those who live from points south. I agree with Jef though– E-W alignments that cover EP, Brown, Downcity, and Olneyville feel pretty important if this is going to be a true strategy shift to trunks (which I would support). Little mention of fares. RIPTA’s high $2 fare would be an impediment for much use between only 6 stations. I hope the authorities, if they actually use a 6-stop shuttle (not the trunk lines as Jef suspects) look into making it free, at least for the first year or two, to jump-start transit use downtown and get attention to this amenity. At the December CTC conference, it was noted that Denver had a free transit shuttle from their RR station thru the central district to their civic center, that helped get attention to transit generally (which is why Denver was invited to present here.) New Haven also has a free CT bus shuttle between their rr station and New Haven Green. RIPTA used to have a low-cost “short-zone” downtown but that was discontinued about 13 years ago. A free shuttle here could also work to build commuter rail ridership. I’d rather see them use $17,000,000 to provide support for the Superman building. I think it means more to downtown. Although I understand that they want to use/not lose this fed money. I don’t think this transit project will be successful at all. This plan is mind-boggling. It has all the elements of Bus Rapid Transit except the Rapid – a long route with limited stops that actually moves people efficiently. On a 1.4 mile route, most origins and destinations are in walking distance. Uber will be faster and competitively priced. Wi-fi? You’ll be at your stop before you agree to the Terms of Service. Also, having a lower-fare, specially branded downtown shuttle was tried before, the LINK (I see that’s being recycled for the 195 land now). It didn’t work, and the routes were lengthened and subsumed into the rest of the bus system (at full fare). I concur with spending the money on an east-west R line. Making the R line something more than a limited-stop bus with an identity crisis would be nice, too. It would be so easy to have a free fare zone within any route passing through downtown if we used a nice cheap low-tech self-validated proof of payment system. Just do the spot checks outside of the free zone. Add a short shuttle line only if the capacity or extra frequency is needed. It really bugs me. Expensive fare collection equipment and lengthy boarding process wasting everyone’s time because the worst possible thing is someone steals a ride. As Barry and others have said, a lower priced short zone should be implemented on this route. $1 or 75¢ or 50¢ ? The drivers might fight such a proposal. How would short zone prices be enforced on regular bus routes that use the corridor, but extend beyond the hub or transit terminal (train station or hospital district)? What path would an east-west route to Olneyville follow? Thayer to Downtown to Empire is the easy segment. Beyond that to the west the route fragments. Westminster at Hoyle Square has the high schools and the Cranston Street split. Broadway is more direct and less congested, but has less commercial and development potential. Having ticket machines is not off-board payment, at least as I think of it. A key feature would be having stations which one pays to get into in order to be able to board all at once– through all doors. I think that the failure of bike policy is once again evident. This is a short, flat route, and connecting it with bike infrastructure– real bike infrastructure, not paint– would do more to connect this area than a new bus line, especially with bike share. Not to say then that transit money wouldn’t also be useful, but in my view getting the lines on the map to be ‘thicker’ is more important for transit than ‘adding lines’. In other words frequency rather than multiplicity of overlapping routes. The R-Line comes close to doubling for much of this route, as does the 1, but frequency would help (and maybe tweaking the routes). Clarifying that point: What I mean is that the current lines are probably spaced too far to be useful on foot, but with good bike routes and bike share they wouldn’t be. And from there, if I had to choose between a new line and more frquency on existing lines, I would choose more frequency (5 mins instead of 10 on R Line; 10 instead of 18-20 on 1). Adding a new line is mostly needed because of the deficit in biking (which itself is cheaper). How would short zone prices be enforced on regular bus routes that use the corridor, but extend beyond the hub or transit terminal (train station or hospital district)? Once again, the wonders of the low tech paper self validated ticket. Honor system backed up with spot checks and escalating fines. Paper tickets are sold by vending machines near bus stops, by any stores, by mail, whatever. At every bus stop and on the buses simple validating machines stamp your paper ticket with the date and time and if there are zoned fares, location. Like present day transfers, a validated ticket is good for 2 hours. While riding, you are subject to a random spot check. You must have a valid monthly or weekly pass good for the zone you are in, or a valid ticket. If your ticket was validated in a zone other than the one you are in, you need a multizone ticket. A similar scheme can work for the people who will not be happy unless they can pay for the bus with their phone. Via app you pay for unlimited monthly or for stored value but you must open the app and tell it within a minute of every time you board a bus. Instead of every bus needing a device to check each passenger’s phone for evidence of payment, only the fare inspector would have to carry such a device. All this talk of reduced or fare free zones really just makes me wonder how much implementing something like that will end up costing with the the new tech that will need used or headaches it’ll cause the drivers trying to make sure people aren’t riding out of the free zone without paying. Would all that really be worth the extra dollar or so per rider? I mean, at that point why not just make KP or these new stops board fare free regardless? Feels like pie in the sky kind of thinking but whatever. Personally this new route doesn’t impress me at all and it’s really kind of disillusions any of my hopes that RI was truly looking forward to investing and promoting bold new transit options. There are already plenty of buses that run by the train station to downtown. Checking at my current time I see 7 within the next half hour (3 of which are on the R-Line). I really can not believe that educated professionals arriving to Providence on the train wouldn’t be able to figure out how to catch a bus from the station to KP and figuring out how a transfer works. Plenty of poor and less educated working class people without as many options do it everyday. So here we are, throwing 17 million at this so we can watch some of our political leaders go on about how great transit is and how modern workers want to work in a city with great transit all the while letting 3200 jobs run off into the middle of the woods far far away from our capital city. Sorry for my pessimism. Here’s hoping they’ll surprise me with some good news on the 6 – 10 connector later. Pittsburgh used to have a very simple solution for its downtown free zone. Any inbound bus was paid at boarding time based on the boarding zone. If you weren’t going the full ride to downtown, you told the driver and paid the appropriate fare for a 1-zone ride. After the bus crossed a certain boundary, the ticket box was not used at all and all doors opened at all stops for boarding and disembarking. For outbound buses, payment was made at bus departure based on the exiting zone. Most people were making the full run, so it wasn’t that hard for riders and drivers to deal with 1-zone fares. Not the most efficient, since debarking is funneling through the front door only, but presumably in less congested/populated areas than downtown. Downtown movements very quick, without giving up on revenue. Fare zones that work isn’t new and isn’t rocket science. I’d say that Pittsburgh’s downtown is about the same size and walkability as Providence and the Jewelry district, though much more densely urban. I generally walked, but it was a nice option to have when working downtown to pop from one side to the other and back quickly during a lunch break or for the T riders to be able to get across downtown without needing a transfer. Also worth noting that Pittsburgh doesn’t have KP like transit hub, the entire downtown zone is essentially the hub because of the number and frequency of buses and the loops that most of the routes made through downtown as part of their turnaround. I’m going to do a quick interview on this project this week. What would people like me to ask about? 1. Will the bus stops use neck-downs that extend to the traffic lane to eliminate bus maneuvering to speed boarding? And, if so would level platforms that meet bus floor height be considered? 2. Will bus stops be able to accommodate more than one bus? 3. Will there be a special lower fare (or short zone) for the corridor? 4. Will every stop have a canopy or bus shelter? another question: why does it cost $17 million to develop a 6 stop bus corridor that already has a lot of buses on the route? And were will the $4 million of state money come from? Does this include a bridge over the railroad to connect Gaspee to Exchange St? Will exclusive bus lanes exist where they are needed to actually allow buses to pass slow and stopped traffic? Considering that signal prioritization remains an broken promise on the R line why should we expect anything better from this project? Barry, if you want to really go crazy, start wondering why $17 million for 6 bus stops while we are expected to believe we will be spending no more than $3 million on brand new Interstate highway interchange. Not sure about the signal prioritization broken promise. I ride the R-Line on N Main Street a lot and the signal prioritization seems to be working fine as my trip takes roughly 50% less time it used to when the old Route #99 ran. I also observe the green lights holding for the bus as it approaches the intersection. Now in terms of off board fare payment and real time arrival information for the R-Line, that’s where more of a case can be made for broken promises. I think where the route gets bogged down is where it crosses Broad Street I-95 overpass at West and East Franklin Streets. Maybe there is the potential long term to short turn the southern part of the route at the southern terminus of this enhanced corridor in conjunction with a transit hub built at that location (near the hospitals on Dudley Street). Also, the northern part of the R-Line can short turn at Providence Station. Perhaps not having to go through Downtown and cross I-95 will allow RIPTA to increase the frequency of the R-Line to every 5 minutes.